"Make no mistake, I am not the sort of god who enjoys playing games. When I return, you will tell me everything-who and what you are-then we shall spend the evening making love." When Maggie O'Hare hears those words she thinks she's lost her mind. One minute she was traipsing around the Mayan jungle looking for her father's excavation site; the next she's accused of being immortal by a guy who swears he's a god. And as for the making love part . . . well, the fact that it sounds like a very good idea is a sure sign she's gone mad. But this guy who calls himself the God of Virility-he's superhot. And every time he touches her, something crazy happens. Backlum Chaam has waited seventy thousand years to meet the woman Fate has chosen for him, and now that she's here, he can't believe his luck. Maggie is brilliant and gorgeous and everything he could have dreamed of . . . except that she insists she's human. But Chaam knows that's impossible-a god could never love a human. And if he seduces one, their passion could have the power to destroy mankind . 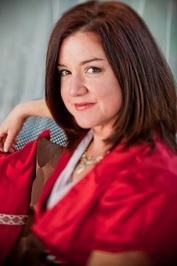 . .
New York Times and USA Today Best Selling Author of Paranormal Romance. Before taking up a permanent residence in the San Francisco Bay Area, Mimi spent time living near NYC (became a shopaholic), in Mexico City (developed a taste for very spicy food), and Arizona (now hates jumping chollas, but pines for sherbet sunsets). Her love of pre-Hispanic culture, big cities, and romance inspires her to write when she’s not busy with kids, hubby, work, and life…or getting sucked into a juicy novel. 1. What is the first book you remember reading by yourself as a child? The Hobbit when I was about six years old. No, don’t be impressed. It was one of those I CAN READ, dummied down versions only 15 or so pages long. It came with a 45. For you “young folks” out there, a 45 was a small record. This one played someone reading the story and had music to go along. Ahhhh…yes. And you thought audiobooks were something new? 3. How does your garden grow? 4. What is the last thing you Googled? I totally Googled myself. Yes, I know ego-surfing isn’t cool, but I have a good explanation! Sadly, ebooks are pirated like mad. To keep up with the pirates, I have to do a web search on myself a few times per month. I find dozens of sites and thousands of people stealing my books. So, so sad. Don’t they know I work 17 hours a day to write those and support my family? Jerks! Oops, did I just vent? Sorry about that. But dang, I feel so much better! 5. What makes you cringe? People who illegally download books (jerks!) and spiders. WANT TO WIN A Copy OF THIS eBOOK? Contest is open to anyone over 18 years old. Void where prohibited. Only one winner per mailing address. Multiple entries will be deleted. This giveaway is sponsored by the author and ONE eBOOK is available. +1 Post about this giveaway on your social networking site and leave me a link here. You can do this daily and receive an entry for each link you leave. One per day per site. Mimi Jean's Accidentally series is wonderfully exciting. I can not wait for the next book. I am so happy I wont have to wait much longer!! 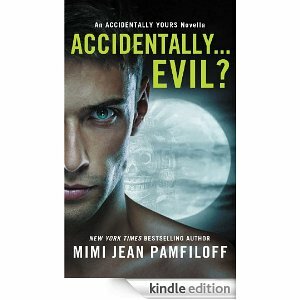 Great contest, love Mimi's accidentally series!!! Would love to win one of her books..like your blog too!! I would luv to read Accidentally Evil. My first Mimi Jean book was Accidentally Married To a Vampire. After that book I was hooked. Love your book i am a huge fan.